SETIA ALAM, Selangor, 1 July 2014 – The key to Malaysia becoming a high income nation by the year 2020 is the ability of the people themselves to be creative to drive the economy unhindered so as to get the best results. Panellists in the Productivity Competitiveness Conference 2014 and launch of The Productivity Report here last week agreed that Malaysians themselves must be allowed to run businesses and to be innovative while the government eases control over the economy. The tone of the conference, organised by the Malaysia Productivity Corporation (MPC), was set by one of the panellists Vice-Chancellor of The National University of Malaysia (UKM) Professor Datuk Dr Noor Azlan Ghazali, who pointed out that Malaysia still falls short in income levels and competitive rankings for a middle-income nation despite having higher Gross Domestic Product (GDP). Other panellists were Prof Bart Van Ark, Executive Vice President and Chief Economist of The Conference Board; Dr Mazalan Kamis, Chief Executive Officer of Institut Darul Ridzuan, a think tank and Anthony Dass, Chief Economist of the Ambank Group Berhad. Prof Noor Azlan said despite Malaysia being ranked sixth in the World Bank Doing Business Report 2014 and 12th in the recent World Competitiveness Yearbook 2014 by the International Institute for Management Development (IMD), Malaysia’s income is low compared to countries that were supposed to be less competitive and business friendly. He said the objective of transforming the nation cannot be achieved merely by changing structures but there must also be a major shift in people’s attitudes towards many things including knowledge for development. As an example, existing government mechanisms will not be able cope with demands for flexibility in running businesses. “Let the Bukit Bintangs be run by Bukit Bintang, not DBKL,” he said. 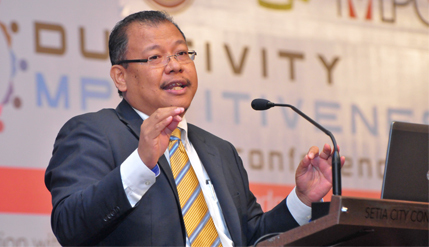 Dr Mazlan, who heads the think tank trying to find new business opportunities for Perak, said transformation means that the people should do the changing not the government. He said that he was often asked at seminars how to transform Perak state from a rural backwater to a burgeoning economy like Selangor or Penang. “To transform Perak, we have to transform the people of Perak,” he said lamenting that it was very difficult to change people on the ground. Unlike in the past Perak, he said, had lost its competitive edge ever since the collapse of the tin industry in the early 1980s. The state is still dependent on the government with 60% of employees being civil servants where nearly half of them having low-level qualifications where less than 6% are university graduates. Dass gave a dire warning: If Malaysia continues to progress in the current situation, it would take 19 years to achieve what South Korea is today. He said creativity and innovativeness among Malaysians have been stifled because the country is so obsessed with ISO certification and standardisation. Malaysians must be convinced that productivity and innovations are the keys to prosperity. The country needed to start with youngsters in school to build up human capital. Benefits provided by the government such as the PTPTN education loans have made youths so complacent and privileged that they feel that they don’t have to work for anything, Dass said. Prof Bart Van Ark, who runs a think tank in the Netherlands, blamed culture for resisting change in Malaysia saying that Malaysia needs a change in mindset to improve labour productivity and boost economic activities and growth in all sectors. The IMD World Competitiveness Centre Director Prof Arturo Bris said Malaysia’s productivity at a mere 2.3% is very low for the middle-income group of countries. “Real productive jobs must be created while the manufacturing sector needs to move fast enough in the high-value innovation level,” Prof Bris said adding that even though the ratio of research and development to GDP is relatively good, the number of patents registered is low.